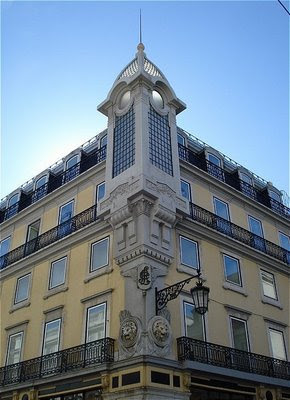 Corner building at Lisbon downtown. LOve this building. I like those lion heads and the iron work especially. I had this great idea I would do a series of the iron railings on the balconies of Paris. One problem, shot from streetside they don't show well. I would have to gain access to apts. across the street etc. I love the thought of that but not feasible I would think pour moi! That is some really neat architecture, my husband will like this photo! It's beautiful! I love the lamp especially, and what looks like a monogram at the very center of your photo. Just imagine having an apartment on the top floor! Glad you all liked the building. Properly decorated, very artistic, nice and clean. Roughly, how old could this kind of a façade be? Well, downtown Lisbon was completely destroyed by the big earthquake on the year of 1755, so reconstruction took place on the late 18th century. Yes, the big quake. The kind of event which would have you counting "years before" and "years after". Yes, Per, you can say that regarding Lisbon downtown. However a few buildings have survived the earthquake here and there, being the Cathedral (Sé Catedral) one of them, dating from 1150! Amazing isn't it?